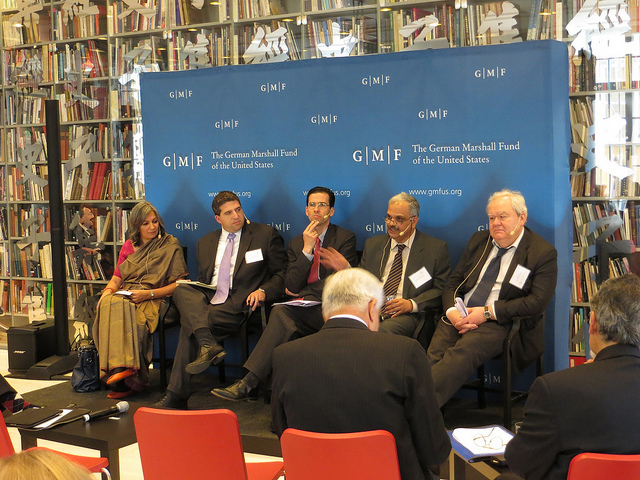 I attended the 6th India Trilateral Forum in Stockholm recently (April 12-13, 2013). The India Trilateral Forum’s are organized by the German Marshall Fund of the United States, with support from the Swedish, US and Indian governments. I had attended the previous two meetings too and it is the only meeting that brings together such a diverse group: scholars, practitioners and some business people. Since most of the academic meetings I attend include only the first category (and a sprinkling of retired members of the second group), this was an interesting change. In previous meetings, I found business leaders more optimistic and somewhat less cynical than academics, and it was no different this time. The meetings were held at the Ostasiatiska Museet, Skeppsholmen in Stockholm. Appropriately enough, since China was central to much of the discussion, our proceedings were held at the Beijing Conference Room. The proceedings were held under the Chatham House rule, but agenda was very wide. Broadly, there was considerable concern bordering on pessimism among the European participants about the Euro, and understandable confusion about what might happen with the Indian general elections next year as well as the state of the Indian economy. On Afghanistan, there was a difference of opinion, with most Indian and American participant expressing various levels of pessimism and the Swedes surprisingly optimistic. The panels on the nuclear issue and on energy were particularly noteworthy, with Manpreet Sethi making a typically excellent presentation about India’s concerns on the former. I was on the panel on India’s ‘Look East’ policy which was largely about India-China dynamics in Asia. I made four points: that trade and political ties needs to be kept distinct because, as we have seen in the recent past, improved trade ties alone are unable to prevent interstate disputes; that India's ties with specific Southeast and East Asian states were going to develop faster than with the region as a whole because countries with specific concerns about China are likely to come together faster; that overall, concern about China will drive India’s strategic engagement with the rest of Asia; and that Indian reluctance to balance China will probably continue but to the extent that it does balance China, New Delhi will prefer internal to external balancing. I also argued that the general sense in Delhi about taking a middle path between Washington and Beijing (Non-alignment 2.0) might not be very feasible because unlike the Cold War period, India has an active dispute with one of the two choices (I had critiqued Nonalignment 2.0 earlier here). Overall I felt that the meeting accurately reflected the uncertainty of the times.